Upon arriving at the University of Texas, Robison was part of one of Mack Brown‘s most impressive recruiting classes, that included Vince Young, Selvin Young, Kasey Studdard, and Aaron Ross. Initially Robison found himself at linebacker, but proved to be most versatile for the Longhorns at defensive end. He’d put himself firmly on the radar with a solid showing at his pro day in 2007 for the NFL draft. 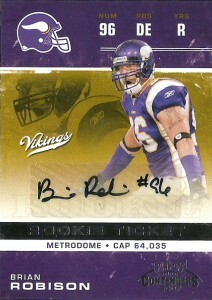 The Vikings, nabbed Robison in the 4th round of the draft and penciled Brian in at defensive end. He’d start 5 games his rookie season and also play on special teams. Although it has taken him some time to crack the starting lineup for the Vikings, he was finally given a starting nod in 2011 where Brian had a career high 8 sacks. He also is known for his temper, and was fined $200,000 by the league for kicking TJ Lang in the groin. Robison apologized and the two have since moved on from the incident.